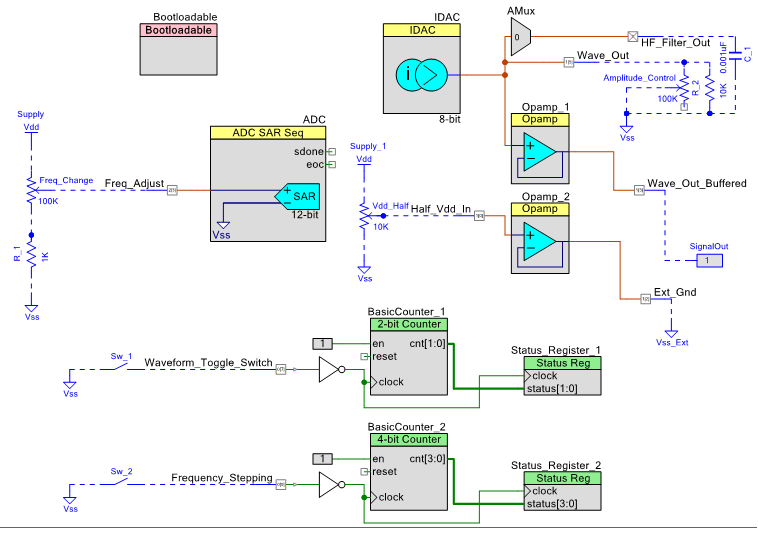 Generating Sine, Square, Triangular, Sawtooth Waveform with Direct Digital Synthesizer method using PSoC 4 MCU and few passive components. Ever drooled over Oscilloscope, Function Generator, Logic Analyzer but can't afford those cool stuffs? Then, here is the good news! Build a fully functional decent Function Generator under 10$. This project is about making a Direct Digital Synthesizer Function Generator that can sprout Sine, Square, Triangular, Saw waveforms. It's also possible to program other random waveform patterns. Direct digital synthesis (DDS) is a method of producing arbitrary waveform of any type using DAC. The PSoC 4 has 2 internal IDACs or current DACs of 7 bit and 8 bit. For this device 8-bit IDAC is used because it provides better resolution. To produce sine wave, there is a lookup table/array holding 256 value points of a full cycle sine wave. CPU reads those values and pass to IDAC to generate proportionate current. This current is drained through a resistor to generate corresponding voltage level. Finally that voltage is buffered through one of the internal Opamp to get the output signal. Since, IDAC requires few uS settling ( some value between 1-10 uS ), there is a maximum limit of higher frequency that can be achieved from a 8-bit lookup table. That's why higher frequency is achieved by skipping values which will increase the stepping noise (harmonics component). This image is showing the visible steps in a triangular wave. It can be improved by passing the signal through Low Pass Filter. An automatic LPF will be implemented inside PSoC using Analog Multiplexer and an external capacitor. For user input 3, 100 k pot and 2 push switches are used. One of the pot is connected to ADC. CPU reads ADC value at the end of each wave cycle and adjust output signal frequency by varying delay. This pot will allow fine tuning the frequency. The second pot will control gain/amplitude of output waveform by changing the IDAC load. Vp-p can be any value between 100mV to 4900 mV. The third pot is connected to the input of the second internal Opamp of PSoC 4 which can output almost any fixed DC voltage between Vcc and Gnd. This signal can be used as external ground for the signal, which will allow offset capability. After understanding the working principle, it's time for a quick breadboard prototyping with a beta firmware. And it worked! Once the concept is verified from prototyping, it's time to build a permanent solution. Finally, soldering all the points complete the circuit. 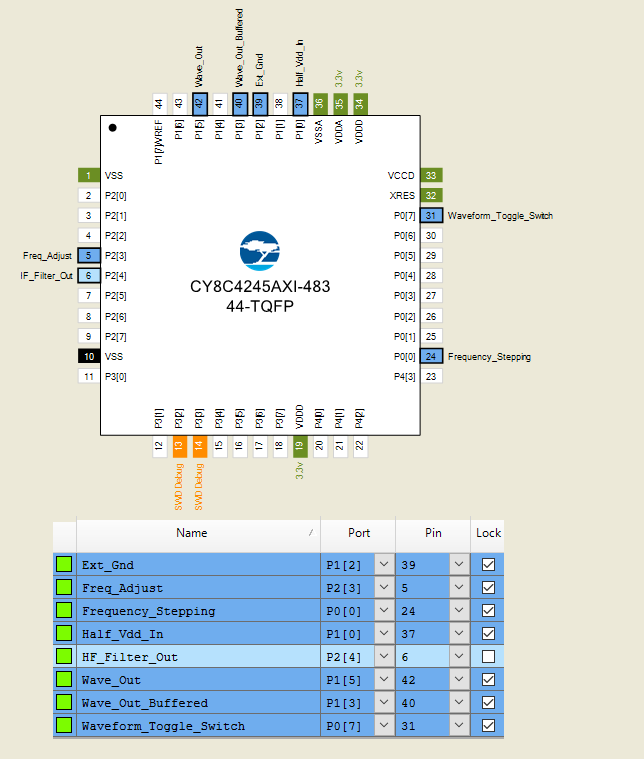 PSoC Creator 4.2 is used to configure the internal hardware. First bootloader component is configured. Next, ADC, IDAC, Opamps, AMux components are dragged and dropped from component catalog and interconnected with virtual wires. 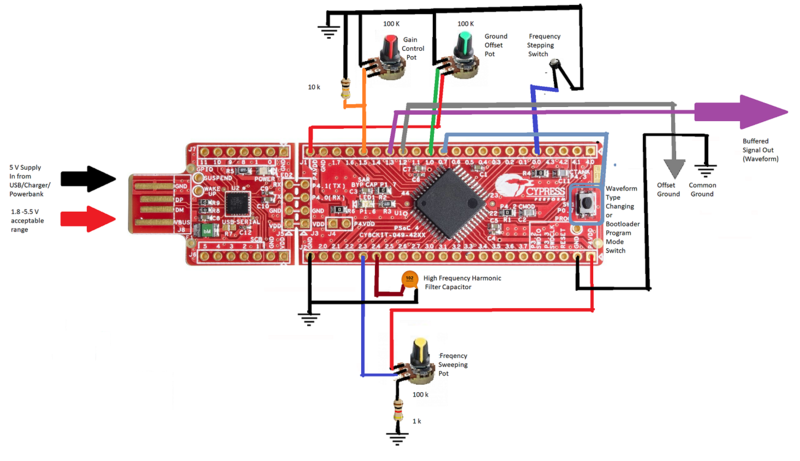 Since, this is a System on Chip, so after compilation these components will wire up internally with programmable data paths! The internal system clock (IMO) is set to run the CPU @ 48 MHz to reduce code execution time which has direct impact on output frequency. Then, the C code is written for the ARM Cortex M0 CPU. Finally, code is compiled and uploaded to the kit. Check these tutorial for details. Now, we have a fully functional function generator (no pun) ! Check the following video for device operation. The device is good for hobby and educational purpose but not good for professional works. There are some limitations that may turn this device useless for some applications.. Although, some of these limitation can be improved by adding additional hardware and developing better firmware. My Fate is Dinosaur's Fate - Extinction !